Early morning hours of 18th August India, when most of the population were sleeping, three days after country celebrated her 69th Independence day, India won her first medal at Rio Olympics 2016. After two weeks of disappointment, a country of over 1.3 billion resident inhabitants will now have a spring on their step. Overseas Indians will announce it loud in their offices, media will have this running on their ticker and hashtag whole day and officials will celebrate this medal of relief. 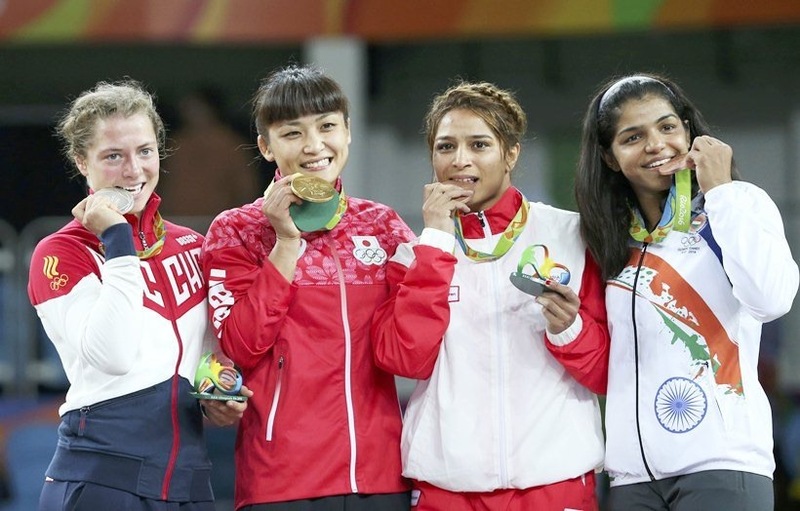 23 year old girl from Mokhra village, near Rohtak, Sakshi Mallik’s bronze medal has made her only the fourth women medalist in India’s scarce history – after Saina Nehwal (Badminton 2012), MC Mary Kom (Boxing 2012) & Karnam Malleshwari (weightlifting 2000). Sakshi won it in the 58kg freestyle wrestling event. Incidentally, wrestling gave India their first every Olympic medal (KS Jadhav) way back in 1952 too. For most part of the night, it seemed Sakshi would stay in the cold after she lost her quarterfinal bout to Valeria Koblova. Previously in the evening Kidambi Srikanth (badminton) had lost gallantly to Lin Dan (World no.3), Vinesh Phogat (wrestling) lost her quarterfinal bout to a freak injury and was quickly rushed to the hospital. it all looked so familiar a script for India. All medal hopes and prospects were getting sidelined one by one. But lady luck struck when Valeria reached the gold medal round and as per wrestling rules her last two vanquished opponents (in Semis & Quarters) will fight for the bronze medal. This was a stray of luck which came to Sakshi’s way and she now had to make full use of it. Sakshi’s thrilling bronze medal fight got the worse possible start as she was down 0-5 in little time. But as it happened in three of her four bouts earlier the day, she came from behind with decisive moves. Sakshi rallied to make it 5-5 in the bronze medal match vs Aisuluu Tynybekova. With few seconds left on clock, the Haryana girl produced a decisive three-point move to conquer India’s first medal at Brazil Rio, winning the bout 8-5. The rest as they say is history. Watch her wrestle back from the dead! Congratulations to the girl from Mokhra village, her parents, backers, coach Ishwar Singh Dahiya and support staff. 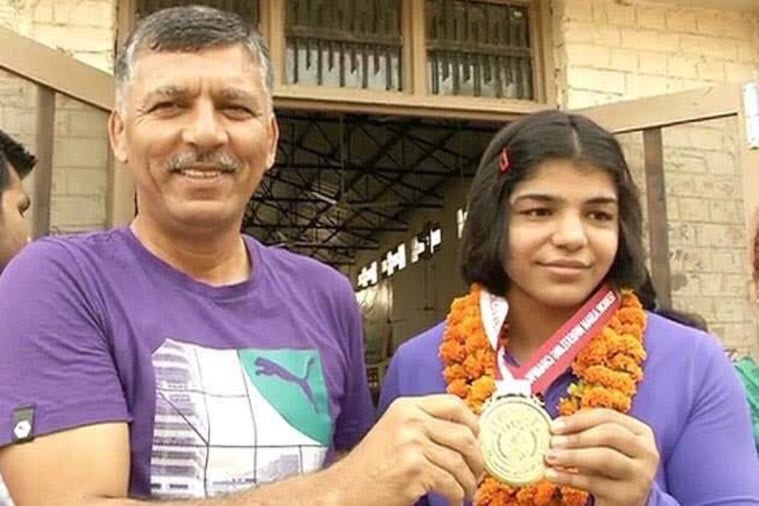 When all of ten years old, Sakshi’s Mother, Sudesh Malik had had admitted her to the Sir Chotu Ram Stadium Wrestling Academy in Rohtak. Most days her mother would accompany her to the wrestling academy as she trained gallantly, even with the boys. Thirteen years of dedicated sweat, perseverance and never say stop attitude got them what such devotion deserves. Kudos girl and support staff. You’ll deserve all the riches and fame in the world. It’s time India’s honorable prime minister, Shri Narendra Modi Ji, upgraded his #BetiBachaoBetiPadhao slogan to #BetiBachaoBetiPadhaoBetiKhilao ; with Sakshi as brand ambassador.